We offer a low-moisture cleaning process which doesn't soak your carpet or pad and dries in about one-hour. We first do a thorough vacuuming of the carpeted surface to be cleaned, including vacuuming the edges of each room, and then spray a mist of our proprietary, water and citrus base solution onto the fibers of the carpet. The solution is environmentally safe, as well as being kid and pet friendly. 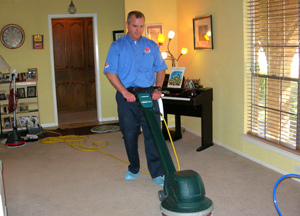 It's enough moisture to allow us to clean the carpet fibers without soaking. We use a machine that runs at about 185 rpms, which allows us to agitate the carpet fibers and do a gentle but thorough cleaning. We finish with a complete grooming of the carpet, leaving you with a clean, fresh carpet that will be dry in about one-hour. Heaven's Best Carpet Cleaning of San Antonio, TX, offers a wide variety of services. We treat our customer's right and strive to be a company you can trust. "Mr. Dooley was able to remove stains that other carpet cleaning companies had not." "This is my second time using the company. Excellent service. Always on time and very reliable. The carpets looked great after they were done. The carpets were dirty from dogs and heavy..."
"...traffic areas. I would highly recommend this company." "The carpeting is as clean as it was when first purchased. All spots are gone; entrances to the 4 rooms no longer soiled. The service man provided an explanation for why we had the dirt..."
"...build up at the room entrances."